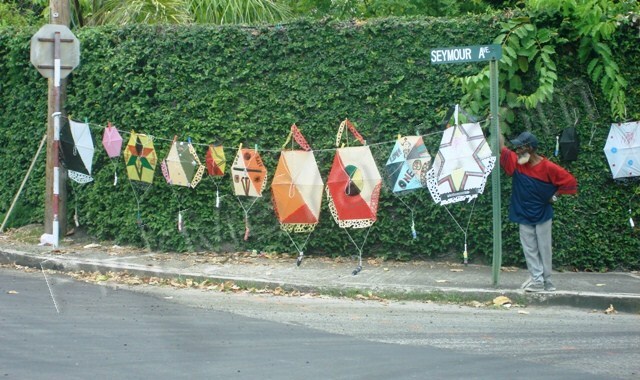 Vendors dot the sides of most Jamaican roads and they sell such wonderful treasures! 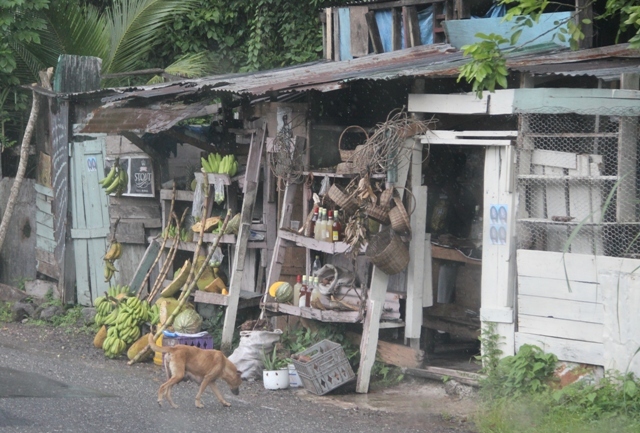 They sell all sorts of things, but they almost always include tropical fruits, handcrafted items, herbs, and drinks. I love it when I see the rum bottles of all colors. 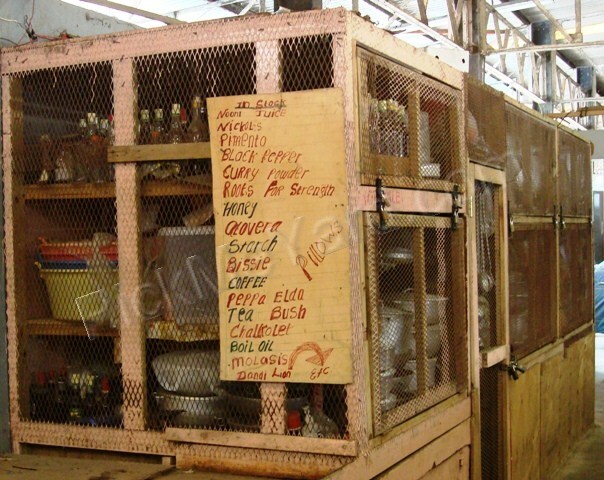 The rum is long gone, but the bottles are filled with fresh juices and tonics that are special recipes. 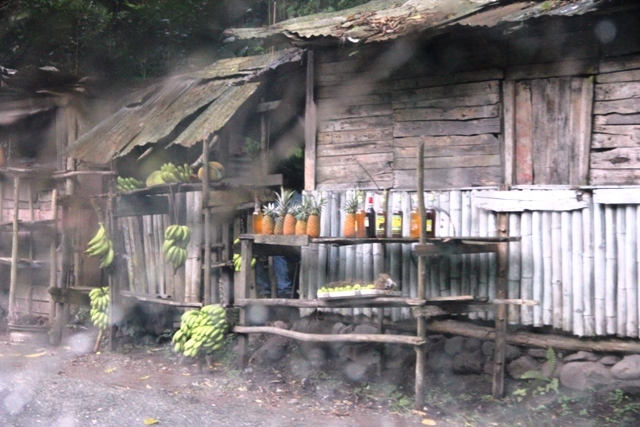 Fresh, Jamaican noni juice is quite a popular one. My favorite is the Jamaican roots tonic. A Jamaican vendor selling colorful footballs and coconuts. 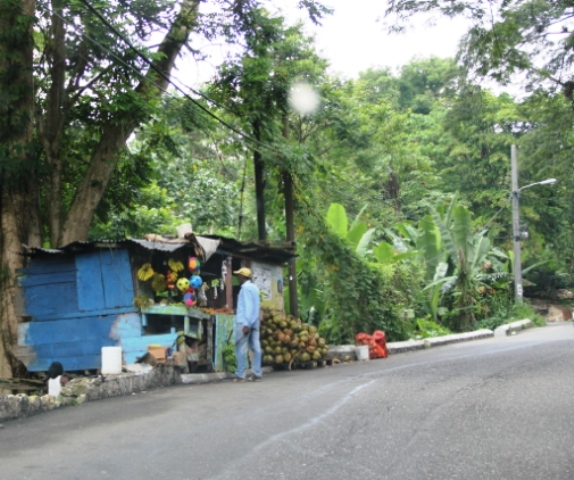 A roadside vendor in Kingston. Pineapples, tonics and bananas for sale. 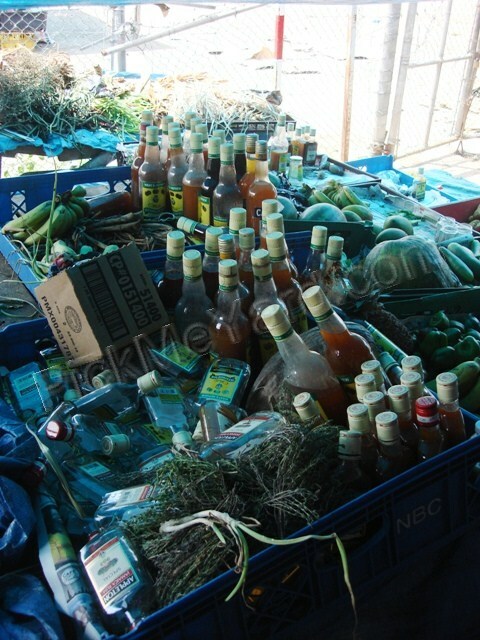 A typical Jamaican variety of sellable items. The Jamaican root tonic is mysterious. I have questioned so many people about it over the years and found that only a few of them know anything about the roots drink. Most of the time, the answer I get is just an eyebrow lift and a giggle. The reason is that roots are generally known for being a potent aphrodisiac (a Jamaican Viagra). However, I recently learned there are many root tonics in Jamaica. My new favorite is a concoction made by Ms. Bernice at the Ocho Rios market. She gave me a tonic for all-over vitality and energy. She openly shared her recipe with me and sent me home with all kinds of interesting herbs and roots. My son and I visited her at the market late in the day on a Saturday so she was the only vendor left. It ended up being our lucky day because she spent hours talking to us. We learned so much from her. 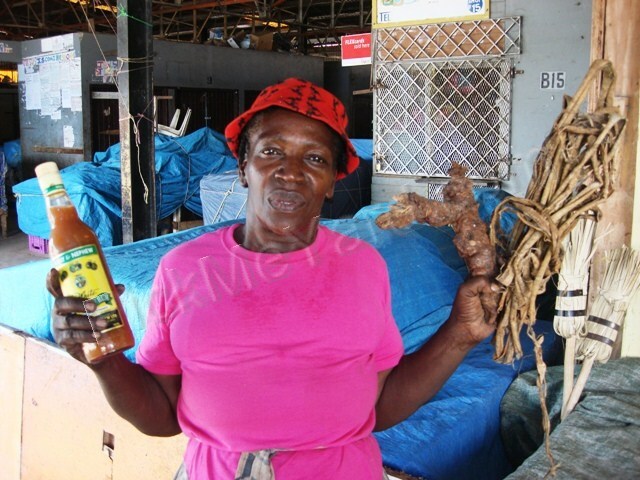 Ms. Bernice holding up her roots tonic in a rum bottle. 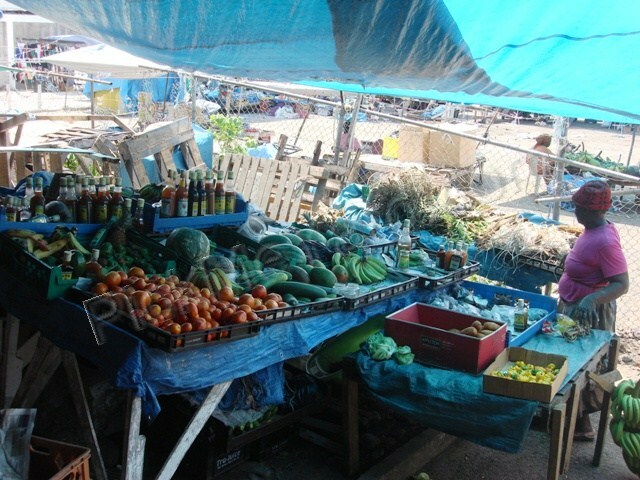 A vendor stand at the Ocho Rios market. These are some of the Jamaican roots from Ms. Bernice's market stand. Ms. Bernice handed me a big bag full of roots and explained each one to us. I kept telling my 10-year-old son to help me remember. We remember her giving us chaney root, sarsparilla root, breadnut root, nickel, dandelion root, kola-nut (which is a seed also called bissy), molasses, honey, Jamaican peppermint (savory) and … I think that’s it. Ms. Bernice said to boil all the ingredients in a huge pot and let it simmer for a couple of hours. Cool, strain and bottle. Apparently the root tonic gets better as it ages and does not need to be refrigerated. I haven’t made my own roots yet (and not sure I will). I’ve been enjoying Ms. Bernice’s bottle. She told me to drink it with a glass of ice and so I have. However, I live by the motto “everything in moderation”. 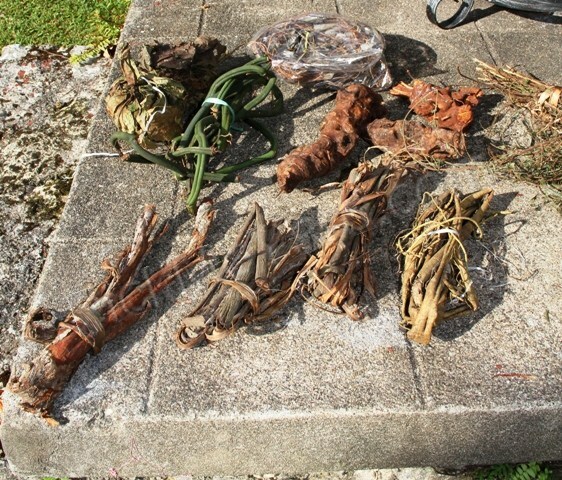 Jamaica is absolutely alive with folk medicine. They are tuned in to the nature around them and continue with century-old customs and traditions. Many of their ways probably need more study. An in-depth book that I recommend on the topic is called Jamaican Folk Medicine: A Source of Healing, by Arvilla Payne-Jackson and Mervyn Alleyne. Some other great books are Healing Herbs of Jamaica by Ivelyn Harris (7th Generation Maroon Herbalist) and Bush Doctor by Sylvester Ayre. These books are part of my home library and I refer to them often. This post wouldn’t be complete without mentioning Uptown Top Ranking by Althea and Donna... it rocks! We planted purple carrots this year called ‘Cosmic Purple’. We ordered the seeds from Baker Creek Heirloom Seeds, but they can be purchased lots of places. A bunch of Cosmic Purple carrots. 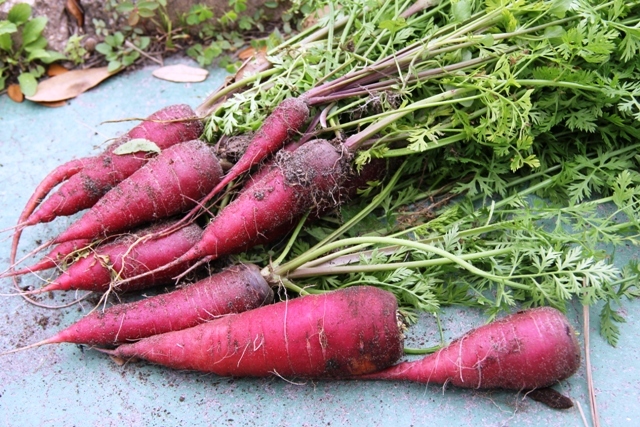 The funny thing about these carrots is that it seems like somebody painted them purple. When I scrub them with a veggie brush, the purple comes off and they’re orange underneath. I’m careful not to scrub them too hard. My kids think they are the bomb. Edible, purple roots. See... the purple comes off. That's a fake snake in the background. Sliced up Cosmic Purple carrots. Aren’t they beautiful? These beauties are delicious and definitely jazz up a boring, old salad. 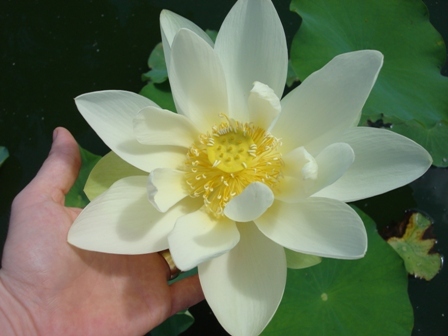 We purchased a small cutting of a beautiful lotus for our water garden last year. I hadn’t even thought of growing them until I visited Tadege in Ft. Lauderdale, Florida. 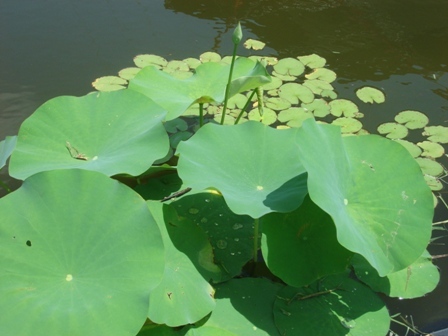 He has the most gorgeous lotus plants growing all over his backyard oasis. I assumed they would be too tropical for Southwest Florida and I assumed I needed a huge pond to grow them in. I was soooo wrong. 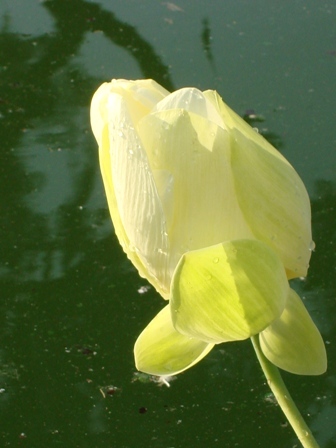 A lotus flower growing in our small pond. 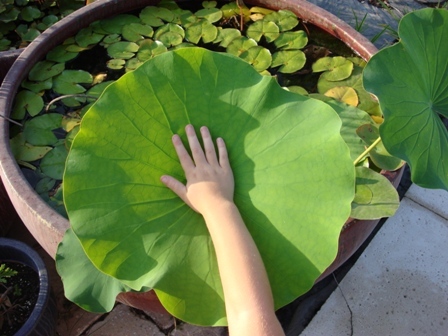 I now have several pots of lotus growing in our small, backyard pond. Since we had such a cold winter last year, I took them out of the pond over the winter and put them in a few pots of water to keep them wet. The lotus were dormant and the pots looked like there was nothing in them but soil and rocks. (I cover the tops of the pots with rocks to keep the soil from floating to the surface of the pond). I didn’t pay them much attention to them over the winter. They even dried out a couple of times. When the weather warmed up this year, the lotus came back to life. I was so happy to see them as I absolutely adore these plants! I found a great website called Winter Care Lotus with lots of information about how to over-winter lotus. This is about three weeks of growth of the lotus in our pond. 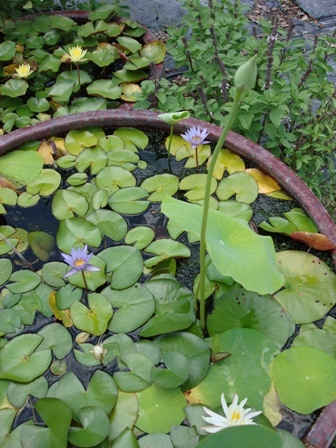 I put the pots with the emerging lotus back into our pond. They are surprising us with flower after flower. A lotus bud that is just about to open. This flower is several days old. The leaves will soon fall off and a seed pod will remain on the stem. 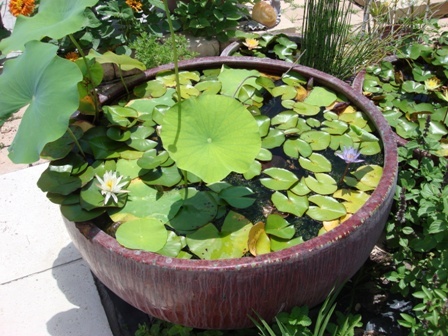 The lotus grows well in pots used for water gardens. It stands to reason that the bigger, the better for the pot size that is used. I think that a 3o gallon pot is sufficient. TaDeGe says a 15 gallon pot is sufficient. I have lotus growing in several of my pots that I use as water gardens. The lotus that is growing in our small pond is being decimated by our three ducks. I have to come up with a solution to this problem. One of our water gardens. 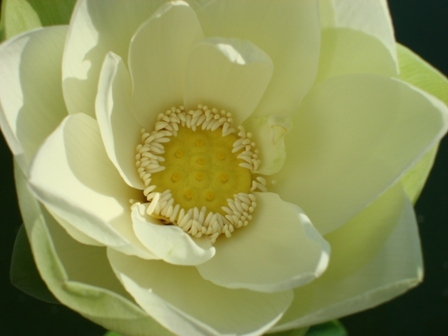 This one has lotus and several varieties of lilies growing in it. The tall bud sticking out is a lotus bud that will flower soon. 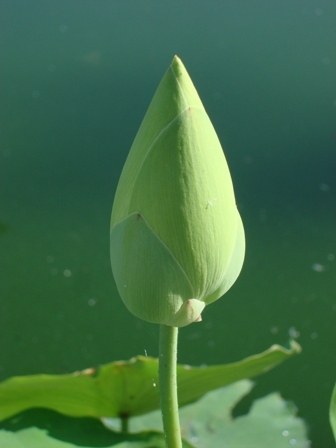 The lotus bud starts out small and gets bigger and bigger until it pops open. I bought my original lotus from TaDeGe in Ft. Lauderdale, but he sells it as a “pick up only”. I found a website, aboutthelotus.com, that has a list of places all over the U.S. to buy lotus. 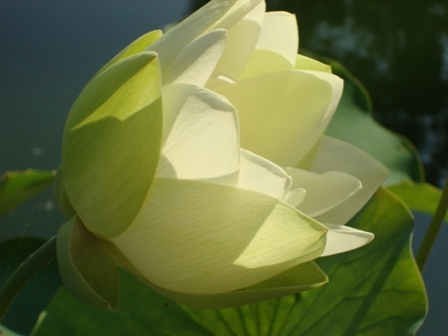 You can grow lotus from seed but it is better to start it from a cutting. 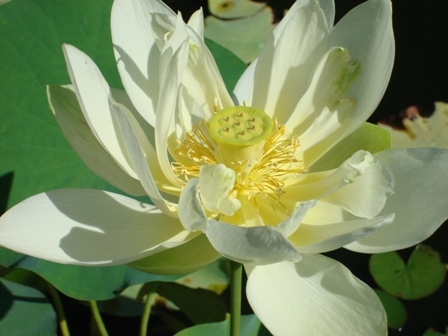 Did you know that lotus is edible? It’s a staple of the Asian diet. Grayson and I couldn’t wait to try some lotus root. My next post is going to tell you all about our experience eating lotus. Carrots are originally from Central Asia and the Near East. They were introduced to the American colonies in the 17th century and they were purple. 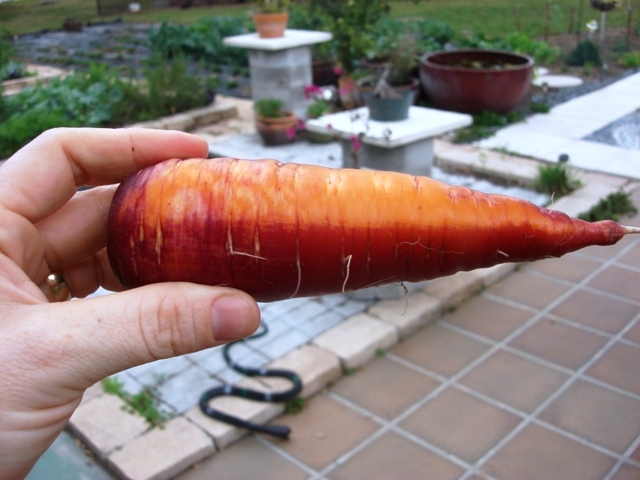 The Dutch developed the orange carrot. 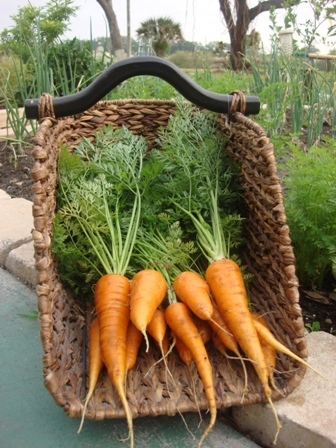 Thomas Jefferson grew several varieties of carrot in his Monticello garden. I have yet to meet a kid that won’t eat a fresh carrot they picked with their own hands. My kids won’t touch them after they’ve been cooked though. My favorite way to cook them is with honey, ginger, butter and kumquat rind. There are many varieties of carrots. They come in different sizes and colors. We’re growing short and long ones. Did you know the baby carrots in the bag at the grocery store are not really baby carrots? I just recently learned they are full-sized carrots that are cut to look like baby carrots. 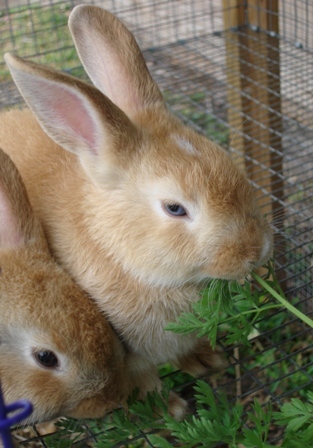 Apparently, the public demand is greater for the baby carrots. 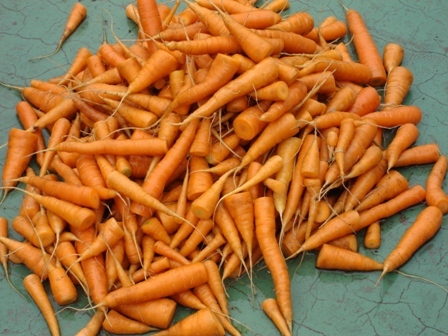 California grows 80 % of the carrots in the U.S. 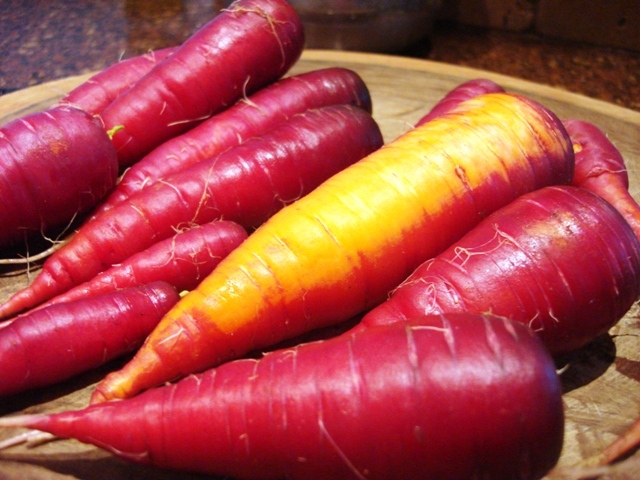 They are an excellent source of beta-carotene and fiber. The body converts beta-carotene into vitamin A and this helps to reduce certain types of cancers. 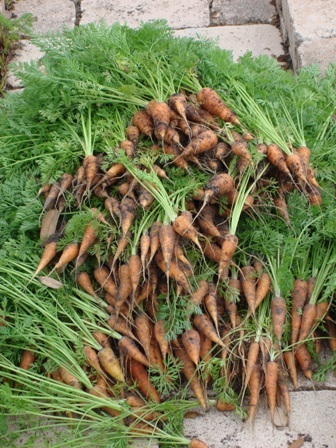 Carrots are usually ready to be picked at 65-75 days. Heat and humidity makes them turn bitter. They can be stored for 30 days in the refrigerator when fresh, but it is best to eat them as soon as you can to get the most vitamins. We grew lots of carrots last year. I would harvest a few and put them in the refrigerator. The next day I would find them limp and yucky. I wondered how the supermarkets keep carrots fresh in the bag for such long periods of time. The key is to cut the green tops off them. 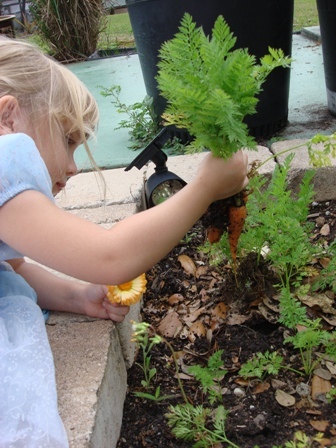 The tops draw the water out of the carrot and they wilt. This year I cut all the tops off immediately after I harvested them. It’s sufficient to just cut the green part off and not the entire top of the carrot for storage. 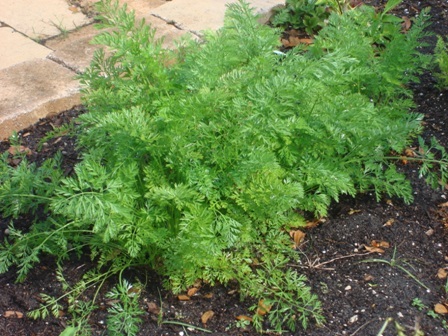 Carrots seedlings are supposed to be thinned out after they have grown about an inch of leafy green. If you don’t thin them out , you will end up with a bunch of tiny carrots that didn’t grow because they were all trying to grow in the same space. 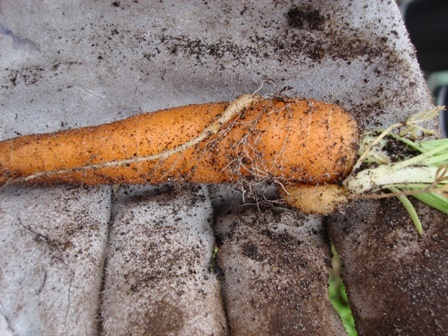 Thinning them allows the carrots roots to develop properly. I know I am supposed to thin them out and I still have trouble doing it. The picture above shows what can happen when they are not thinned out. One little carrot is growing around the other. 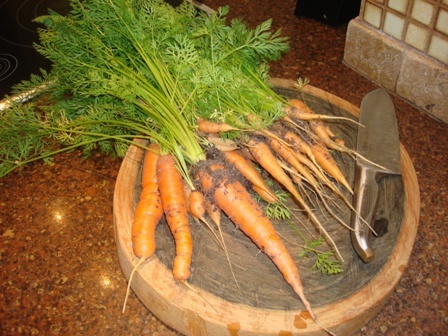 Most backyard gardeners don’t harvest all their carrots at the same time like I did today. I decided to pull them and blanch them for storage. I’ll save some for eating fresh. Carrots can store up to 9 months in a regular freezer. They will store up to 14 months if kept in deep freeze. However, if you’re going to freeze them you must blanche them first. To blanche them you will need a pot of boiling water and a bowl filled with ice water. Cut the carrots up or leave them whole (if they’re small). Boil them for 2-5 minutes, drain them and then put them in the bowl of ice water to hastily stop the cooking process. Now they’re ready to be stored in the freezer in a ziplock freezer bag. My family adores carrot juice. The pile of carrots in the picture above won’t last long around here. I usually make carrot juice the Jamaican way. 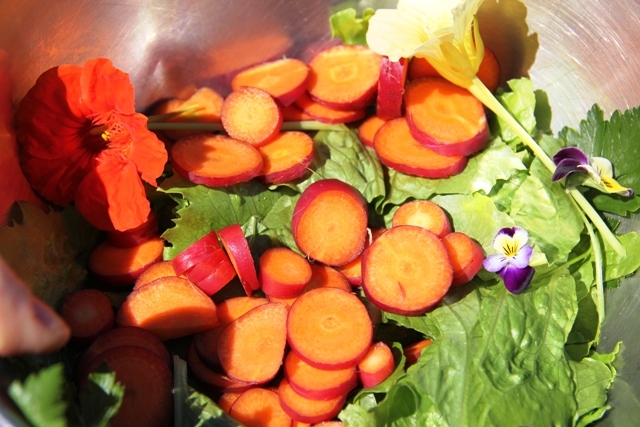 I juice the carrots with a juicer and I give the pulp to the chickens, worms and bunnies. I add a little water, condensed milk, vanilla and nutmeg to the carrot juice. There is a recipe at Jamaican-recipes.com for the specifics. I don’t measure ingredients. I just add a little of this and that. Jamaicans usually make this juice with a blender, not a juicer. They use a strainer to separate the pulp from the juice.